It's time for AR to shine. When Google announced its Daydream View headset last year, it was a sign that the search giant was ready to take VR to the masses. It's dabbled in VR before with Cardboard, but the View was a much more serious effort, with its fabric-clad design and user-friendly remote. Which is why it's such a surprise that Google didn't really spend a lot of time on VR at its Pixel 2 event. The company mentioned the new Daydream View -- now in colors! -- but didn't really say much more beyond that. Instead, Google was much more excited to talk about something else: AR. Even though Google announced ARCore, its augmented reality platform, a couple of months ago, the Pixel 2 event was the first time the search giant could talk about it at length on a public stage. As a reminder, ARCore is essentially Android's answer to Apple's ARKit. With it, developers can create and test AR apps with a regular phone, no specialized hardware required. Last month, Google showcased several ARCore examples that let you travel the world, plan home renovations and desaturate the world around you. At the Pixel 2 event, Google's Aparna Chennapragada showed off even more ARCore tricks. You can use it to view a showroom from Houzz right in your own living room, watch a League of Legends match play out on your dining table, or even create virtual models with Lego pieces. "It's a powerful way to bring physical and digital together," she said. But aside from relying on partners, Google has made its own AR product too. It's called AR Stickers and it's built right into the Pixel's camera -- indeed, for now, AR Stickers are exclusive to the Pixel hardware. They're essentially animated emoji that you can place in your photos and videos -- the demo on stage showed a woman posing next to a giant animated coffee cup on a park bench. Google didn't stop there, however. It also teamed with several content partners to create AR Sticker "packs." One exciting example that Google demonstrated on stage included AR Stickers from Netflix's Stranger Things. 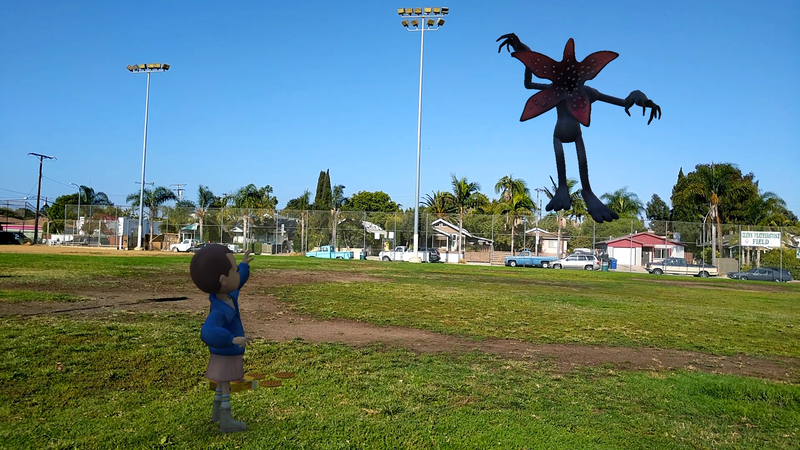 The demo placed cartoon versions of the demogorgon (the monster from the series) as well as Eleven (the young girl) on stage and before long, the two started to fight -- and Eleven destroyed the demogorgon in a blink of an eye. Chennapragada said that we can expect more AR Sticker packs from SNL, YouTube, NBA as well as the upcoming Star Wars movie in the future. What's more, the latest Pixel 2 and Pixel 2 XL are optimized for AR. The cameras on both are designed for robust tracking of low-light conditions and have 60 fps rendering. Seeing as both Pixel phones were likely on Google's product roadmap for a long time, it's no longer easy to dismiss ARCore as simply a knee-jerk reaction to Apple's ARKit. With roots in Project Tango -- Google's other AR platform -- the company has probably been working on phone-based AR for quite some time. Which brings us back to why VR was only a blip in today's event. While Google is still working on bringing VR content onto Daydream -- examples include Ed Sheeran in "Austin City Limits Backstage" and Discovery's new TRVLR series -- AR is just so much more accessible. There's no need for a special headset, or even a cardboard-based one; all you need is your phone. And, pretty soon, ARCore will be available on most if not all modern Android phones with Oreo installed. Apple has certainly jumped on this bandwagon too, going so far as to say that AR is the way forward, and not VR. Google, on the other hand, is not quite so quick to give up on VR -- it'll continue to invest in virtual reality and Daydream. Yet, it's clear from today's event that Google's betting more on AR than VR to win over the masses. And that might not be such a bad idea.